I’m just going to get right to the point. I loved this book. I can’t think of any real negative things to say. Right from the start, I loved the writing and concept. Sarah J. Mass is such an amazing storyteller. She’s such an amazing author. Everything about this book is so fantastical and glorious. Even though I loved the writing and concept from the start, it took me to about page 180 to really get invested in the characters. I really like Feyre. I didn’t think she was annoying or stupid and she could really hold her own. She was so well written and awesome. I did want to slap her up the head a couple of times though. Tamlin was also a really cool character. He was really interesting and right away I wanted a back story. However, as the story progressed, he got less and less interesting compared to two other characters. Rhysand and Lucien completely stole the book for me. Both are such interesting, complex characters and I couldn’t wait to read more about them. Towards the end of the book, Rhysand had completely hooked. I just wanted to know more about him as a character. I loved the pace of this book. It was fast but not rushed and kept me entertained the whole time. So much happens in this book but it all unfolded at a natural pace. This book could easily have been a standalone (though I’m glad it’s not) so I’m insanely curious to know what happens in the next book. 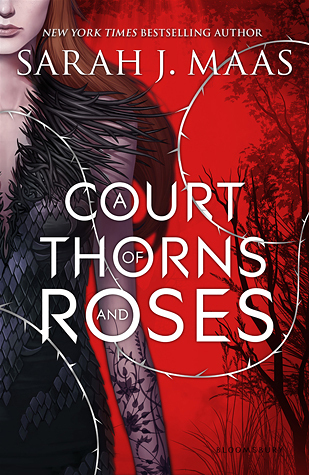 Overall, A Court of Thorns and Roses is definitely one of the best books I’ve read this year and one of my new all time favorites. I loved everything about this book and the last quarter had me half dead (in the best way). I couldn’t put it down and I was completely hooked. I highly recommend this book to everyone. It took me a while to get into it too but once I did I absolutely loved it! I agree that Lucien and Rhysand were extreme highlights in this book. So well written and I’m dying to know Rhysand more. I want the next book in the series solely to see more of him and what happened to him at the end. Agreed! I’m so sad we have to wait so long for the next book though. LOL. I need it now!